With the recent release of Battlefield 3 Beta I’ve noticed there has been a significant amount of commotion amongst the community, especially the console players about why the graphics don’t look as good as they did in the video. I’ve also heard numerous complaints about the PC version having multiple maps for the beta and being able to host more players. Let me start off by saying that Battlefield 3 was developed with PC gamers in mind. The game was developed for the PC first and consoles second and it shows within the game. It’s designed to push the limits of graphics technology and even my video card is starting to show signs of stress with everything maxed to the top. I suspect the retail release will be even more punishing then the beta. I took the time yesterday to play with my Xbox brethren on XBL and the differences between the PC version and the consoles versions are immense. The obvious differences are the max players. The max players on console are 24 vs 32(in the beta) – 64(final release). The second major difference is how much cleaner the game looks on PC as a whole vs the console version. If I could find a good comparison it would be like looking at a used VHS copy of the original Star Wars and then watching it on blu-ray. It’s really that much clearer, crisper and cleaner. The tree’s look much more focused and alive, weapons fire looks meaner, textures look five times better on the PC vs the console, soldiers look more realistic, and the weapons look better. The lack of AA/AF, HBAO and other graphical enhancements on consoles are what kills it graphically. I’m sure there are many gamers that are outraged that the console version of the game doesn’t match the pictures. There are some after reading the first part of this who are even more upset that the PC version looks so much better than there version. This is the first game, in a long time, that has really show the now very wide gap between current PC hardware and Console hardware. ID developer John Carmack said at Gamecon this year that “the PC platform is as much as 10 times faster than the current generation of consoles”. Graphics technology has come leaps and bounds since the release of Xbox and PS3 next gen consoles. The graphics technology was almost 2 years old at the time of the release of the Xbox 360 and that was 7 years ago. Granted PC’s also have to deal with other processes while the console systems ONLY have to worry about playing the games so they make up some of the difference there but not near enough to compete. Does this mean the console version is going to look terrible when it’s release on October 25? Take a deep breath… ok better now? Let’s remember that this is a Beta and even the almighty PC version has a magnificent amount of graphical glitches to deal with along with other issues such as clipping, zoom not working, falling through the map, flying across the map, getting stuck in walls, and many other issues. The console version will look good but not as good as the PC version will, it’s that simple. Console hardware just can’t handle the demand that the game would put on it not to mention that consoles cannot display DX10 or DX11. The console version does play well, very well actually on the console (I played it on the Xbox 360). I think it’s the best playing of the battlefield series and I have played them all. DICE is playing a tricky game here. They are trying to cater to their original audience (pc gamers) while trying to keep their console fan base happy as well and trying to make EA money at the same time. I ask people to remain calm when playing the beta and realize that it’s just a beta. The final product WILL look better, on both systems at that. The version of the game we are playing now was already several months old. Keep that in mind when playing. 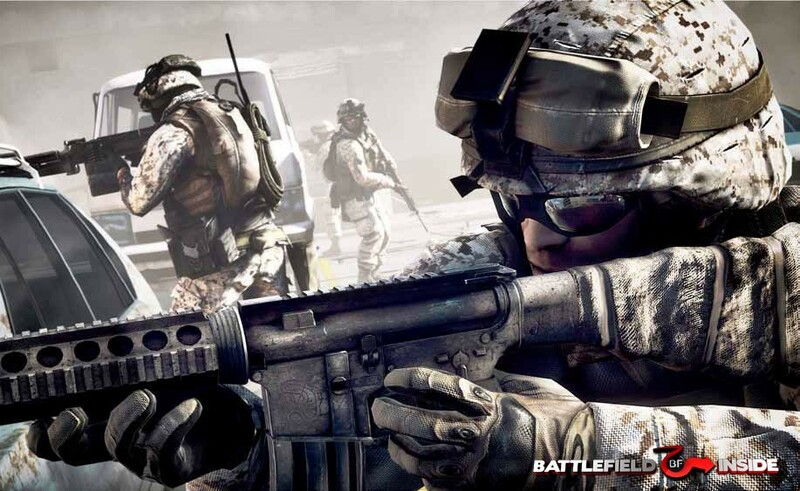 The final version of Battlefield 3 will be released on October 25 for PC, Xbox and PS3. Alto juego, pero pide mucha plac de video!